I’m a junkie for learning, especially when it comes to how people create. 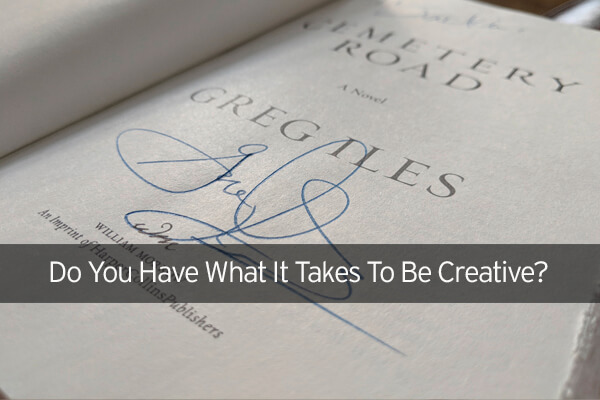 So when the opportunity came up to hear from best-selling author Greg Iles, I jumped at the chance. He’s written 18 books, including the popular Natchez Burning trilogy. One of my favorites of his is “Turning Angel” and I just finished his latest book “Cemetery Road.” It a fast-paced, page-turner with some creepy insights into how the good-ol-boy system just might operate in a southern small town. Iles stopped in Huntsville, Alabama recently on his book tour and graciously turned his time with our group into a Q & A. The audience asked questions dealing with creating, writing, and making a living in The Arts. These are fascinating topics which I hear a lot in conversations, both in person and online. We tend to put successful creatives up on a pedestal – best-selling authors, award-winning actors, chart-topping musicians – and marvel at their ‘creativity’. By doing so, it often feels like only those people really have what it takes to be creative. The rest of us are left with feeble attempts at expressing our creativity. But what if creativity is as simple as finding interesting solutions? It doesn’t have to be an elusive trait only held and practiced by the famous. Creativity isn’t just applied to the arts either. Sure, if you are a copywriter, graphic designer, photographer or other professional ‘creative’ you are using creativity on a daily basis, but anyone who is faced with making decisions and solving problems is also given the opportunity to be creative, to find an interesting solution. Engineers are creative when solving road or electrical grid issues. Accountants are creative when deciding where the numbers can make the most impact. Lending officers are creative when they need to talk with a member about their options. Even jobs which might seem more menial also can be creative. It takes some creative thinking to figure out the most efficient method for cutting grass or picking items in a warehouse. Everyone can be creative in their jobs – it just takes some brain juice! So what are some ways to bring creative thinking into even the most mundane tasks or recurring problems? Design thinking is an excellent method for bringing out creativity. Essentially, it uses the process designers use to create products, software, graphics and other traditionally designed items then applies it to business processes. We’ll have more in a future article – we could spend SO much time talking about this one – but if you’d like more information, check this out. But what if you don’t necessarily need to tackle a larger problem – just need some fresh ideas for your next meeting? Try these great methods for idea-generation from one of our previous articles. When Iles was asked about his talent, he remarked that people usually either have “it” or they don’t. He referenced a famous quote from the movie “Chariots of Fire” – “You can’t put in what God left out.” But that relates to TALENT, especially talent to achieve the upper levels of acclaim. So let’s recognize and use our individual God-given talents, combined with fresh approaches to our problems. Then we can truly experience the flow of creativity. You might find that you are not only being creative, but being the best you can be! Receive tips and techniques to transform your marketing! We'll only use this email to send you love. We won't sell or give your email away. Unsubscribe at any time, but we think you'll find these pretty dang useful.